The Trump administration appears poised to abandon the policy of engagement that has guided the U.S. approach to China for more than 40 years. The flashpoint in relations is the United States’ impatience with China’s unfair trade practices. In April, President Donald Trump promised leniency on trade issues with China if it helped end North Korea’s nuclear weapons program. Writing in the National Interest in the last week of July, Gordon Chang, author of “Nuclear Showdown: North Korea Takes On the World,” made the case that a tweet by Trump in June and two more in July indicated the official U.S. attitude toward China is changing. “I am very disappointed in China. 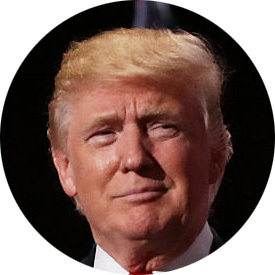 Our foolish past leaders have allowed them to make hundreds of billions of dollars a year in trade, yet … they do NOTHING for us with North Korea, just talk. We will no longer allow this to continue. China could easily solve this problem!” Trump tweeted on July 29. The tweets were followed by sanctions on a Chinese bank for money laundering, as well as the announcement of a $1.42 billion U.S. arms sale to Taiwan. In addition, the United States let the U.S.-China economic dialogue fall apart on July 19—without so much as a face-saving statement at the end to whitewash the failure. 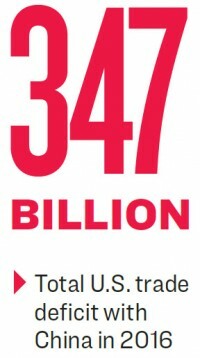 During the talks Treasury Secretary Steve Mnuchin reportedly blamed the $347 billion U.S. trade deficit with China on the Chinese regime’s intervention in China’s economy. In a July 31 opinion piece in the Wall Street Journal, Secretary of Commerce Wilbur Ross criticized China’s and the European Union’s unfair trade practices and asserted that the United States would “use every available tool” to “restore a level playing field” in trade. In retrospect, Ross’s article appeared to be setting the stage for the most dramatic pushback yet by the United States against China’s trade practices. According to media reports, Trump was ready on Aug. 4 to deliver a speech announcing that he had ordered the U.S. trade representative to begin an investigation into China’s theft of intellectual property from U.S. firms, which could have led to sanctions against China. The speech was canceled without explanation. However, the Washington Examiner later quoted sources inside the White House as saying the action was postponed so as not to interfere with a U.N. Security Council resolution to sanction North Korea over its nuclear weapons program. China’s vote was needed to pass the resolution. Trade policy toward China is about much more than trade. At stake are American jobs, businesses, and the health of the American economy—and on a broader scale, the preservation of the international system put in place by the United States following World War II, the defense of U.S. allies, and the avoidance of a possible war. 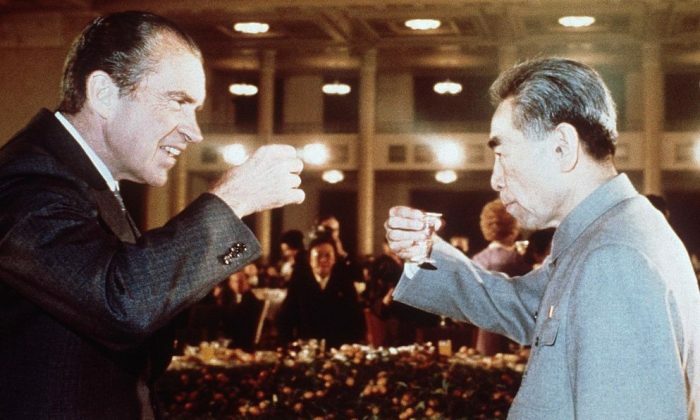 President Richard Nixon’s visit to China in 1972 is widely recognized as a strategic gambit, playing the “China card” to counteract the Soviet Union. It also marked the beginning of U.S. policy aimed at engaging, rather than confronting and isolating, China. 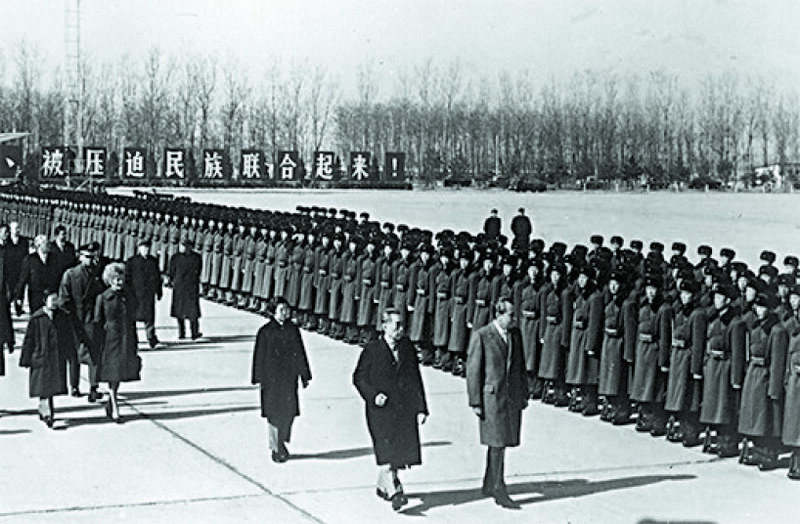 Through engaging China, the United States hoped to transform the communist nation by integrating it into the international system and by changing the country internally, primarily through the experience of trade with Western businesses. As the Chinese experienced Western ways of doing things, they would gradually adopt democratic leanings. Trade would nonviolently lead to regime change. This double promise of engagement—that it would simultaneously lead to democracy in China and to wealth for American companies—proved very seductive to both politicians and businessmen. In the case of China, there seemed to be no hard choices between conscience and interest. Engagement with China led to a kind of gold-rush mentality among American businesses. In the book “The China Dream,” published in 2002, Joe Studwell writes of a longstanding Western obsession with the idea of “untold riches to be garnered in China.” This obsession reached a peak in the 1990s, Studwell said. A milestone was China’s accession in 2001 to the World Trade Organization, a move engineered by then-President Bill Clinton. For decades, we have been very soft on China. We have let them literally get away with murder and not said anything. Anders Corr, the founder of Corr Analytics, which specializes in the analysis of strategic and international political risk, said support for engagement has been strengthened by American businesses that have used their money at home to help lobby for pro-China policies, seeking to get rich in China. Recently, facts on the ground have made it more difficult to defend the U.S. policy of engagement. Rather than being a pot of gold for American businesses, China has often proven to be a bad investment. Rather than becoming more democratic, the Chinese Communist Party has strengthened its tools of repression, such as the Great Firewall, a system of surveillance and internet censorship that, ironically, was built with the assistance of American businesses. Rather than being a pot of gold for American businesses, China has often proven to be a bad investment. The policy of engagement—with its hopes for democratizing China while gaining a piece of its market—has inclined the United States to turn the other cheek to Chinese provocations. Peter Navarro, now head of Trump’s National Trade Council, estimated in a 2015 interview with The Epoch Times that Chinese trade policies have caused the United States to lose approximately 57,000 factories and pushed 25 million Americans into low-wage jobs. China Votes in Favor of Sanctions on North Korea–But How Much Will China Enforce? Chinese trade practices include subsidizing Chinese products in foreign markets in order to drive competitors out of business, restricting access to the Chinese market, manipulating its currency to gain trade advantage, violating U.S. copyrights and patents, and requiring a company doing business in China to have a Chinese firm as its partner and to surrender its proprietary technology. In its 2013 report, the Commission on the Theft of American Intellectual Property found that China accounted for 80 percent of the intellectual property theft from American companies, amounting to $300 billion in losses each year. Such theft from defense contractors and the U.S. government has helped the Chinese military to rapidly modernize. The Rand Corporation’s scorecard of U.S. versus China military strength reports that in 2003 the United States had either an advantage or a major advantage, in seven out of nine categories, in combat in areas close to China. In 2017, Rand reports parity between the United States and China in four categories, a Chinese advantage in two, and a U.S. advantage in three. With growing military strength has come growing aggression, as the Chinese regime has pushed into the East China Sea, the South China Sea, and Bhutan. New U.S. resistance to China’s predatory actions will likely lead to conflict and could even lead to war. The decades of American acquiescence to China have “taught the Chinese that bad behavior produces results for them,” said Gordon Chang in a phone interview. The problem is not just the misguided policy of engagement; it is a clash of cultures. According to Waldron, “when Americans transmit a message of friendship, the Chinese simply assume you are showing you are scared and weak and are impressed by them.” The solution, Waldron said, is for the United States to adopt something more like the Chinese style of communication. Chang said the United States needs to demonstrate political will in order to begin earning respect and deterring the Chinese regime. The stakes are high. “The Chinese Communist Party wants to hurt the United States, wants to take down the international system, and wants to remake it in a way more amenable to authoritarian or totalitarian states,” Chang said. “But it is up to us to defend the international system as it is.” At risk is the future of freedom and democracy in the world, Chang said. Trump’s approach of sanctioning China for misbehavior has a good chance of success, if he has the will to enforce trade agreements, according to Chang. “We hold most of the high cards,” Chang said. The United States runs a $347 billion trade deficit with China, and so China stands to lose much more if U.S.-China trade does not flow smoothly. China’s economy is geared to selling into the United States, but the U.S. economy is not geared to selling into China. The Chinese economy is unstable, while the U.S. economy is stable.